Setting classic fantasy elements in a modern day, technologically advanced world can be a tricky feat to successfully pull off. There’s always the risk of the two failing to mesh well, and sometimes the true vision of a story gets lost between the emphasis of cool magical factors and a modern day setting for the sake of simply having a modern day setting. Wolf Children manages to avoid these pitfalls by defining its identity as a film within the first few minutes – yes, the story does follow two children who inherited the ability to switch between wolf and human bodies thanks to their late father being one of the last remaining wolf people in the world, but the core of the story revolves around the mother and the challenges she faces as a single mother raising two children, both of whom just so happen to be able to transform into furred beasts. 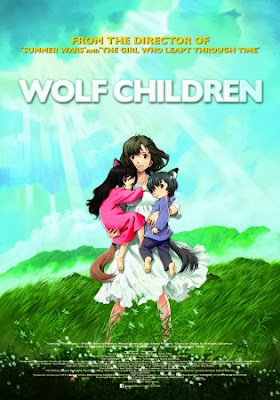 The film specifically denotes young Ame and Yuki as wolf children instead of werewolves, because they do not carry on the typical behaviors exhibited by werewolves in European literature (or any other vision of werewolves, truthfully). Whether Ame and Yuki held the ability to transform into wolves or not, they would still be as adorable as ever, with Yuki being the more rambunctious and mischievous older sibling, and Ame being the quiet and shy one. Their mother, Hana, must deal not only with typical challenges brought on by raising two young children, but also must keep secret the fact that her children are part wolf. Early in the film, when Ame and Yuki are still toddlers, Hana finds the big city life presents too many risks for her children being exposed as part wolf. Ame and Yuki’s lack of understanding as to why they cannot howl at night or chew on the leg of the table leads neighbors and the apartment landlord to believe that Hana is going against the apartment’s code and secretly keeping pets there. A few outings to the park see Yuki bark at passing dogs and nearly expose herself and her brother. Because of these extra everyday hurdles Hana faces, she asks her children if they would like to relocate to the countryside until the day they are old enough to decide for themselves whether they wish to live their lives as humans or wolves. Though he dies before the Wolf Children really gets going, Hana’s husband is still present in spirit throughout the film. 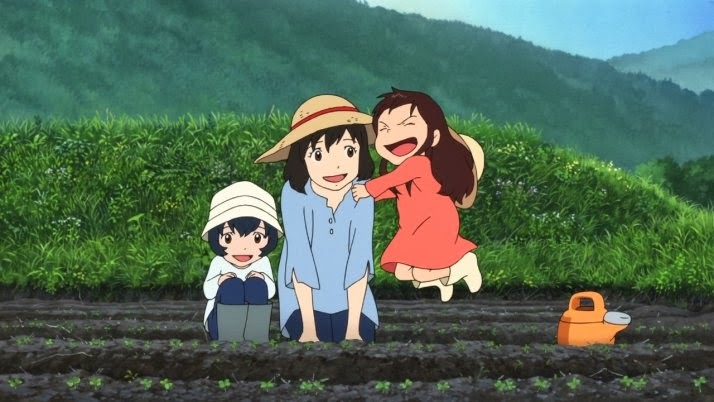 Hana shows a lot of personal strength and determination to rebuild an old run-down house, to plant vegetable in less-than-ideal soil so she can provide for her children, as well as in the way that she handles disciplining and expressing how much she cares for Ame and Yuki. That said, Hana is still human, and the brief dream sequences where she asks her late husband if she is doing the right thing for her family keep her grounded as a character. Similarly, Ame finds he does not enjoy interacting with people as much as he does visiting the local nature center, and attempts to understand an old wolf who lives there in captivity as a parallel to his father, whom Ame knows little about, as he was still a baby when his father died. The film does jump ahead at certain junctures to show how Ame and Yuki adapt to this bold new world – both with their freedom to adventure through fields and forests as wolves and the social pressures to make friends in school. Environments as strikingly different as a school gymnasium, a stream cutting through snow-laden woods, and the farm hills near Hana’s new house are all beautifully realized, as is the gentle soundtrack which reprises the film’s main theme song a few times over with slightly different presentations. But despite how many weeks, months, or years the film might skip over to reach its next important life lesson or learning experience for Ame, Yuki, and Hana, the pacing feels spot-on throughout. Wolf Children is truly a gorgeous film from start to finish, and a genuinely emotional adventure to top it off. Yuki’s obsession with snakes and frogs grosses out her classmates in a hilarious manner, while the scrapes and bruises that Ame gets when he is young and unprepared for the expanse of the wilderness lead him to feel sad and both Hana and the viewer to channel paternal instincts toward him. In terms of its quality as a standalone fantasy film, Wolf Children earns its place among the greats like The Girl Who Leapt Through Time and the works of Studio Ghibli, despite Wolf Children focusing more on the earthly challenges of single parenthood, and Ame and Yuki attempting to both understand the big open world and find their places in it.